We at MarineInvasives.org are overseeing the monitoring of seaweeds that have invaded coastal and island reefs of California. We encourage you to help keep track of these invasions by reporting your sightings when you find them. Continue reading to learn more about these invasive species and how you can help us determine where they have spread. Invasive species are plants or animals that have been introduced to a new region where they are not native, typically become widespread and abundant, and result in negative impacts on native species, habitats and/or infrastructure. Invasive species can have dramatic ecological and economic consequences in their new environment, with billions of dollars spent each year to prevent, eradicate and control them. The coastal marine environment is vulnerable to invasion through human activities such as international shipping, boating, aquaculture, and the aquarium trade. Identifying and tracking marine species invasions when they occur is particularly challenging due to the expanse and inaccessibility of coastal and island marine habitats. Citizens who spend time on or in the ocean can play a key role in documenting the appearance and spread of invasive species by participating in monitoring. Monitoring the distribution of invasive species is vital to their management and prevention of further spread. Detecting non-native species before they become a problem, as well as documenting the range of existing non-native species, are critical for controlling and eradicating them. Also, the more we understand about how invasive species spread, the better we will be able to prevent future invasions. 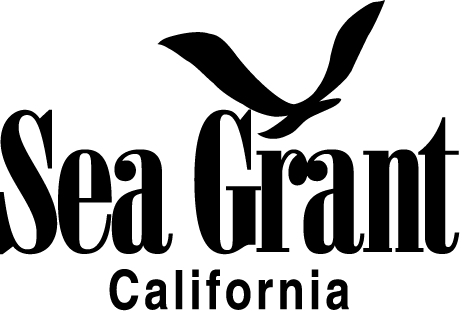 We encourage you to assist with monitoring the spread of two seaweeds – Sargassum horneri and Undaria pinnafida - that have invaded California and Baja California waters. Be Safe: Scuba diving can be a dangerous sport possibly resulting in serious injury or death without proper training and safe diving practices. Always dive within the limits of your training and comfort. Sargassum horneri, referred to as ‘Devil Weed’ by many divers and boaters in southern California, is a brown seaweed native to Japan and Korea that attaches to rocks and other surfaces (e.g., docks and boat hulls). 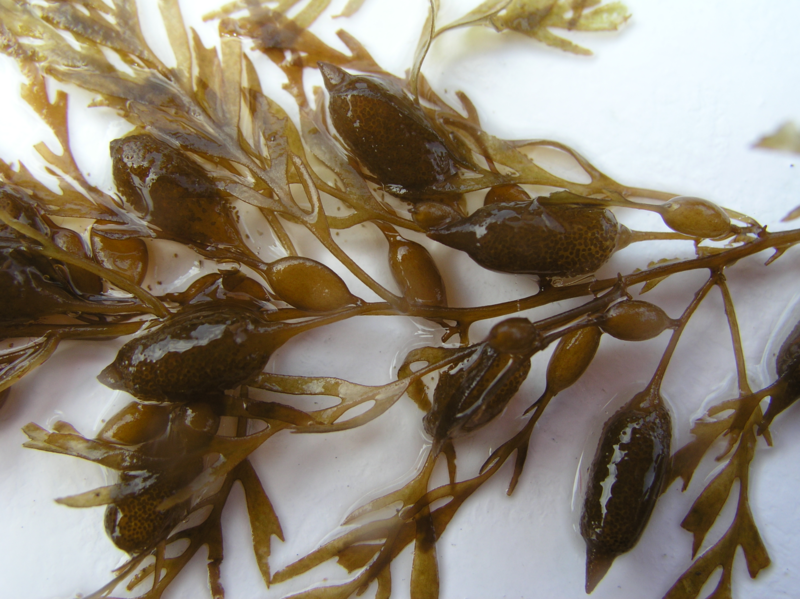 It was first detected in California in 2003 by biologists conducting surveys in the Port Long Beach inner harbor1 and originally identified as Sargassum filicinum, which is now considered a type of S. horneri2. By October 2005, the California population had spread within Long Beach Harbor and S. horneri was found adrift in Todos Santos Bay, Baja California, Mexico. 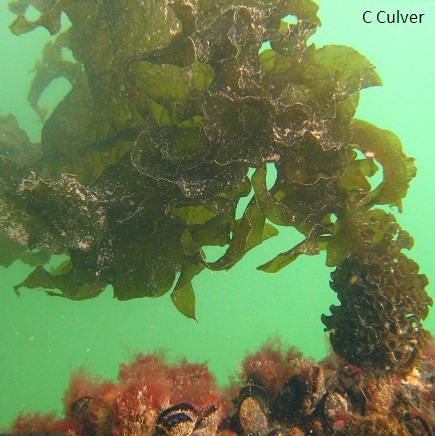 It has since expanded rapidly throughout southern California and Baja California3 and in many places, including the northern and southern Channel Islands, dense populations occupy areas where native kelp beds once flourished. To date, this is the only known invasion of S. horneri (filicinum type); it has not been found anywhere else in the world outside of its native range. The initial detection of S. horneri in a major commercial shipping port suggests it likely came to the US on a commercial vessel. Further spread regionally is attributed to its natural dispersal ability as well as various human activities. Sargassum horneri can spread long distances because as an adult it has buoyant floats that allow it to drift with currents to new sites if detached from the substrate. Just one reproductive individual drifting to a new area may be enough for a new population to become established. It can become detached either naturally (e.g., disturbance from waves or grazers), or by human activity, particularly boating (e.g., becoming wrapped around anchors) and SCUBA diving (e.g., catching on fins and other gear). Sargassum horneri is found at many boating destinations on offshore islands and nearby harbors, suggesting humans may have helped it spread. Be careful to not inadvertently spread S. horneri by intentionally or accidentally removing and releasing it. Spread the Word, Not the Weed! The continued expansion and shear abundance and formation of dense mats of S. horneri has raised concerns about its impact on native ecosystems. 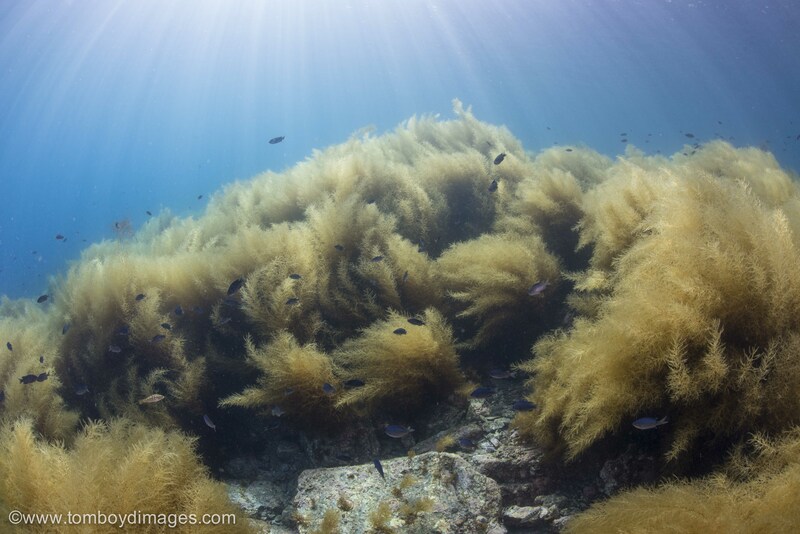 Potential consequences exist for not only native kelp but also the commercially and recreationally important fished species which depend on kelp for food or habitat, like sea urchins and kelp bass. Definitive studies assessing the impacts of S. horneri are currently underway. 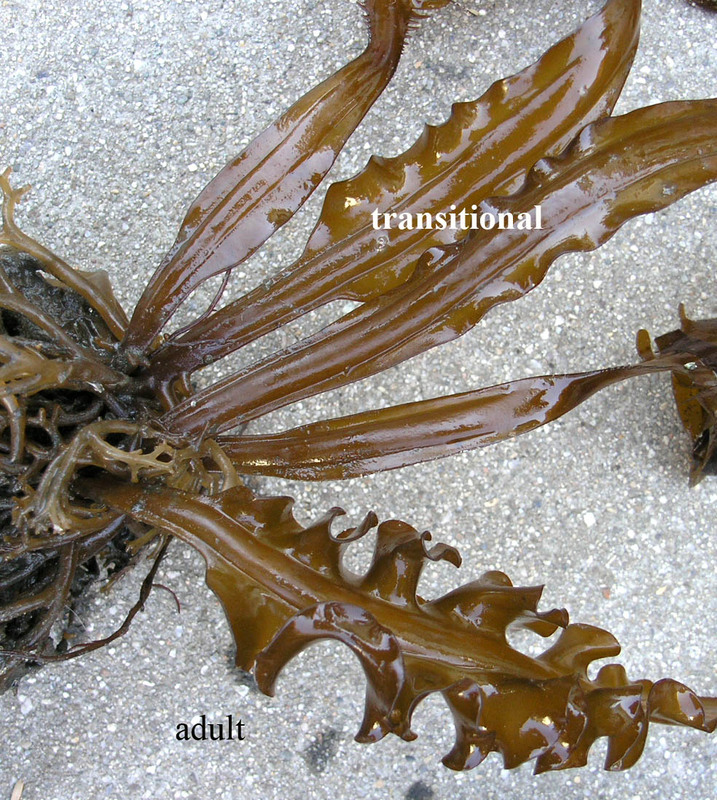 Undaria pinnatifida, often referred to as Asian Kelp or Wakame, is a brown seaweed that is native to Japan where it is cultured for consumption (e.g., miso soup and seaweed salad). It has invaded many areas worldwide. It was first found outside of its native Japanese waters in 1971 in Thau Lagoon along the Mediterranean coast of France. Since that time, it has spread along Atlantic and Mediterranean coasts of Europe, as well as to England, New Zealand, Australia, Argentina, Baja California in Mexico, and California, USA. In California, U. pinnatifida was first found growing in Los Angeles Harbor in 2000 and is now found in numerous California harbors. It has also spread to two locations on the open coast: one small population has persisted off Catalina Island since 20014, and a new population was detected on the north side of Anacapa Island in 2016. It may have spread to other reefs in these areas; surveys have been limited. Undaria pinnatifida arrived in other countries through several different ways. It initially arrived in France with the importation of Japanese oysters. Then, in 1983 it was intentionally introduced along the coast of Brittany, France, for cultivation as food. The original source of U. pinnatifida in Californian waters is unknown. However, its genetics indicate that it may be related to a population in Japan that could have been transported via commercial shipping5. This idea is supported by its first detection in a major port (Los Angeles Harbor) and its ability to grow on the hulls of boats/ships. Further, its occurrence almost exclusively in harbor environments in California suggest that it was also transported along the California coast through boating activities. 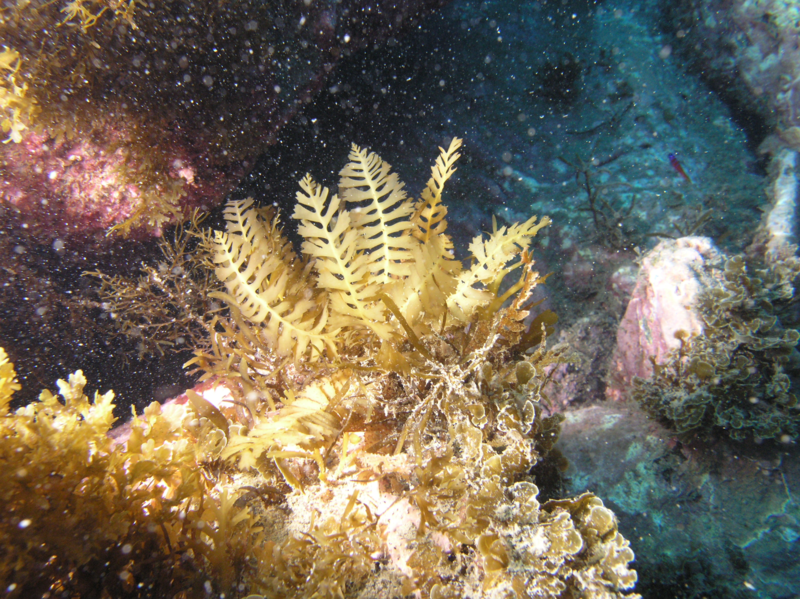 Unlike Sargassum horneri, fragments of U. pinnatifida are not capable of dispersing long distances as they do not contain any float-like structures. Nonetheless, adult plants are capable of releasing microscopic spores that will eventually become new plants. 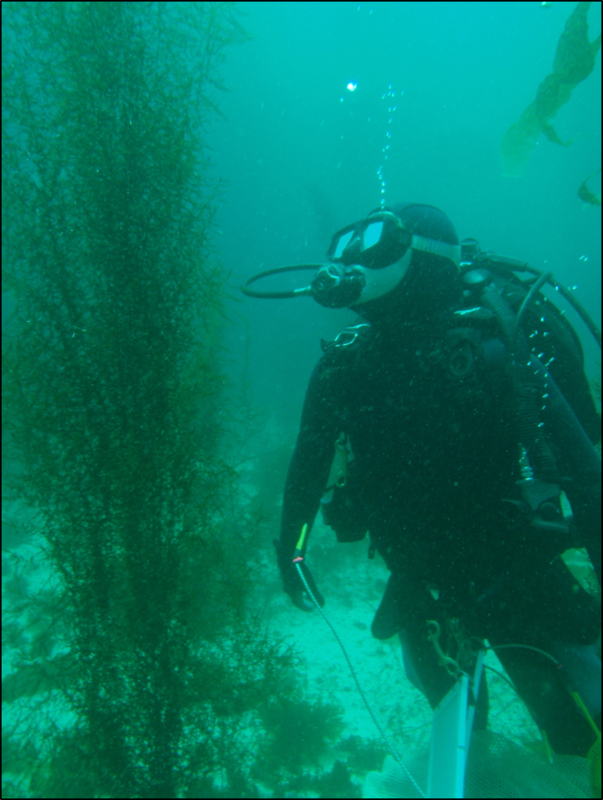 If encountered, divers should not disturb or remove adult plants as it could trigger the release of spores and help the population persist and spread. Undaria pinnatifida is considered a highly invasive species and is listed as one of the world’s 100 worst invasive alien species by the International Union for the Conservation of Nature (IUCN). In some places where it has invaded it has caused a decrease in the number and abundance of native species and interfered with shellfish farming. 4. Miller KA and JM Engle. 2009. 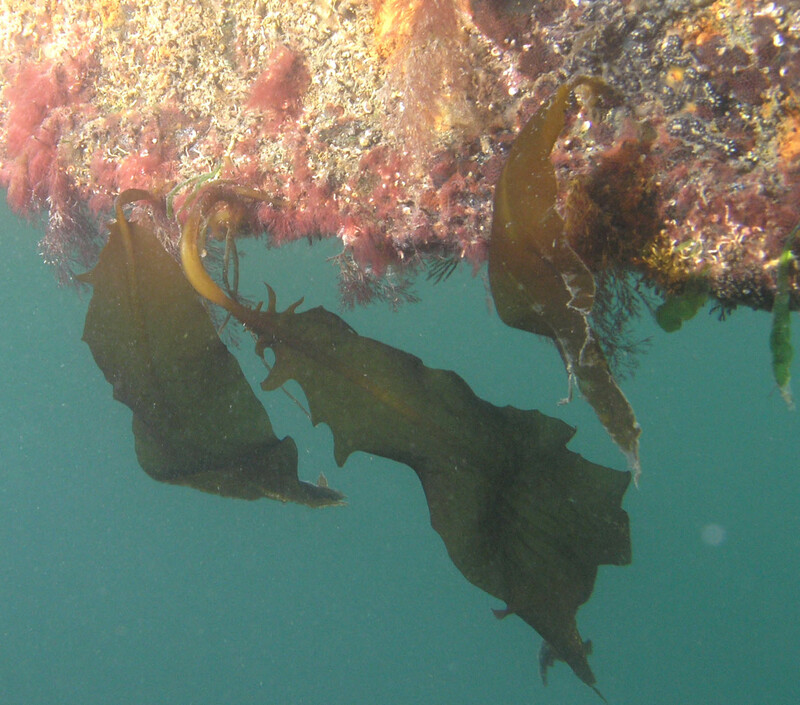 The natural history of Undaria pinnatifida and Sargassum filicinum at the California Channel Islands: Non-native seaweeds with different invasion styles. In: Proceedings of the 7th California Islands Symposium, eds CC Damiani and DK Garcelon. pp. 131-140.